The DS 7 will get PSA's first plug-in hybrid powertrain. 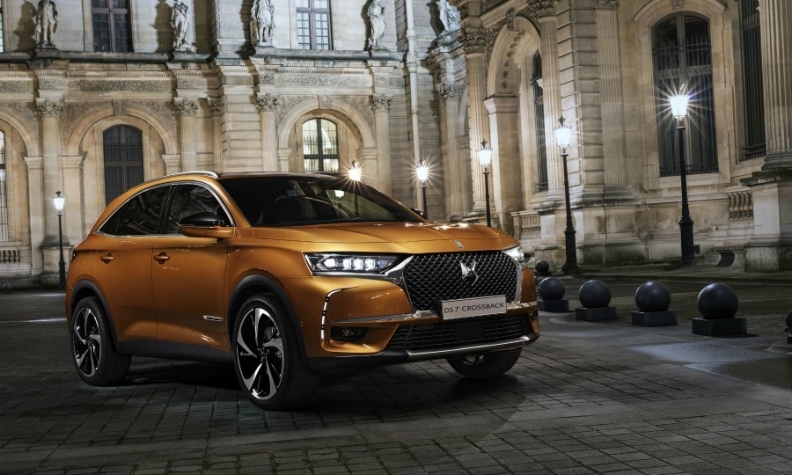 PARIS -- PSA Group's upscale brand, DS, said that all its new models introduced starting in 2025 will have only full-electric or hybrid drivetrains, and that it will present its first battery electric vehicle at the Paris auto show in October. “Our ambition is very clear: For DS to be among the global leaders in electrified cars in its market," DS CEO Yves Bonnefont said in a news release on Monday. DS will be the first PSA marque to launch full-electric cars and plug-in hybrids , a strategy meant to bolster its position as the top brand within the group that also includes Peugeot and Citroen. A DS 7 gasoline plug-in hybrid will go on sale at the end of next year. DS will debut the brand's first full-electric vehicle at the Paris show, Bonnefont said. He gave no further details. Reports have said it will be the DS 3 Crossback, which will replace the long-running DS 3 hatchback. PSA has offered only a limited number of electric or electrified models, but it is preparing to roll out a larger electrified lineup to meet stricter European CO2 emissions standards that come into effect starting in 2020. Future PSA vehicles will be built on either the CMP architecture for smaller cars or EMP2 for larger cars, which are designed to accept a range of powertrains including hybrids and full electric. Last year PSA announced it was starting a joint venture with the Japanese supplier Nidec to design and produce electric motors in France. PSA will offer 40 electrified models across its five brands -- Peugeot, Citroen, Opel, Vauxhall and DS -- worldwide by 2025, CEO Carlos Tavares told the Automotive News World Congress in January. DS was spun off from Citroen as a separate brand in 2014, and the DS 7 was the first model designed expressly for the brand. DS will introduce one new model a year for the next five years. The DS 7 with regular powertrains launched in January in Europe and in April in China. The upcoming plug-in hybrid version will be four-wheel drive with 300 hp and an electric-only range of 50 km. It is expected to sell for more than 55,000 euros. In the past year, premium automakers have announced plans to accelerate electrification. Among them are Volvo, which has promised to offer electric motors on every new model starting next year. Fiat Chrysler Automobiles CEO Sergio Marchionne said that future Maserati and Ferrari models will have electrified or full-electric versions starting next year. Infiniti, Nissan’s upscale brand, said in January that all future models, starting in 2021, will be electrified except the QX80 large SUV. Audi, BMW, Jaguar and Mercedes-Benz have announced similar steps.